The Fabulous Jewelry Of The Stars Exhibit, featured at select International Gem & Jewelry Shows, features jewelry and antiquities from the estates of Elizabeth Taylor, Elvis, Cher, Elton John, Maria Callas, Liberace, Marilyn Monroe, The Duke of Windsor, First Lady Jacqueline Kennedy Onassis and other well-known names from Hollywood and history. Our collection of beloved treasures are on display at a city near you! In the Summer of 1997, The International Gem & Jewelry Show, Inc. purchased Princess Diana's famed dinner dress of cream pleated silk designed by Catherine Walker. She wore this regal gown to a reception in her honor with the Crown Prince of Nepal during a state visit in 1993. Soon after winning the bid, Roxane Duke announced plans to create jewelry from the faux pearls to earn money for Diana's favorite charities. The dress traveled the country for years and was often on display at International Gem & Jewelry Show. For a limited time only, some pieces from the Jewelry Of The Stars Collection will be on sale to the public. Currated by Roxane Duke and brother Arnold, this stunning collection of priceless memorablia is on display and sale at select InterGem Jewelry shows. 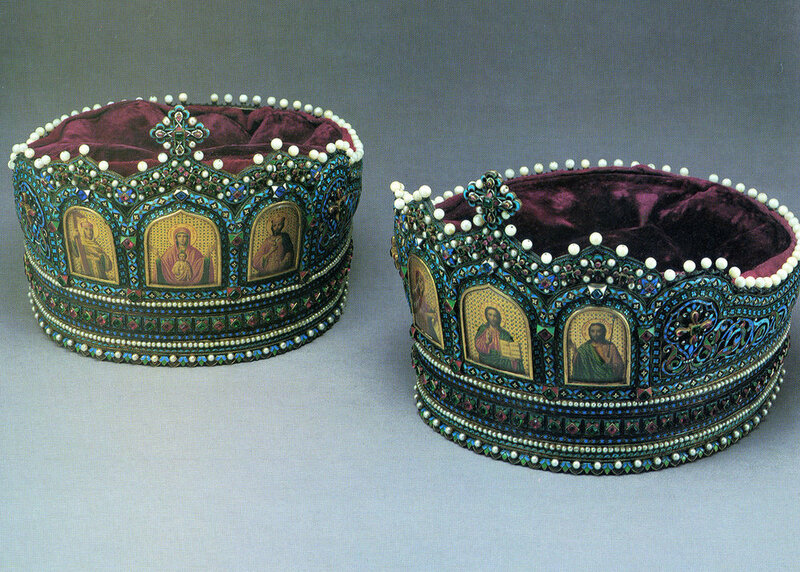 Royal wedding crowns made in Moscow in 1881 by jeweler Ivan D’Mitrovich Chichelev. Cobra gold pendant / pin with diamonds and rubies once belonging to Sylvester Stallone.